Skid steer broom attachments are useful in all climates and all seasons. 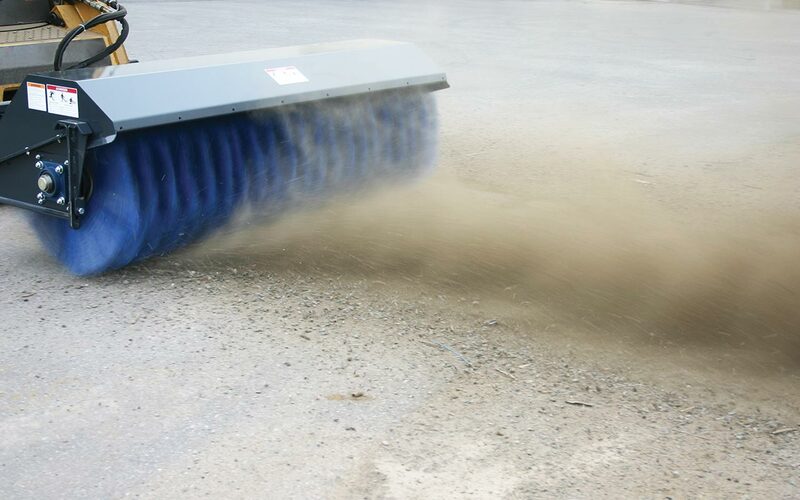 Whether you’re using your power sweeper to clean streets, clear debris from a construction site, or remove snow, following these tips will help you. Specifically, they will help keep your broom in good working condition, extend the life of its wear parts, and protect the ground you’re working on. Here are six tips for using your broom attachment. Using proper downforce is the most important thing to keep in mind when operating a skid steer sweeper attachment. You only want to flick the ground with the bristles. Pressing down any harder than that does more harm than good. Proper downforce not only protects the ground you’re on, but it also is going to protect your bristles. While the bristles are replaceable, they’re not cheap. With proper downforce, operators have a lot of control over how long their bristles last. Another part of protecting the ground you’re on is knowing where your sweeping paths are and aren’t. Depending on the type of bristle (all poly or alternating poly/wire), power sweepers can cause damage to various ground types. For example, sweeping off of the path can damage lawns. With broom attachments for skid steers, you’re dealing with a lot of rotating force and heavy bristles. When a broom is operating, there are multiple functions that are happening at one time, so it’s important to be a conscientious operator. Regularly check for general wear, and follow the maintenance protocols for your attachment. Power sweeper attachments, or anything with hydraulic functioning, needs some time to warm up (especially during winter weather). Allowing the oil to cycle through before getting to work is going to extend attachment life. Depending on the design of your sweeper attachment, you might need to be aware of the motor’s position during operation. We realized operators were hitting or knocking their motor when they were sweeping up against buildings or in tighter spaces. As a result, Virnig broom attachments now have 1/4" thick steel motor guard. That’s right. It’s so important I listed it twice. Using proper downforce is the number one way to protect power sweeper attachments and keep your bristles operating at peak efficiency. Once bristles become bent, they’re not going to work as well as you want them to.